inventory to four months in the Killeen-­Temple area, according to data from the Real Estate Center at Texas A&M University. Killeen is now a seller’s market, with the Texas Association of Realtors reporting 3.7 months of housing inventory at a median home price of $117,000. ​Realtors said that this year more houses are being built outside of the cities, resulting in higher numbers for the counties. At the end of November, there were 590 active listings in Killeen, down 15.4 percent from almost 700 homes in November 2015, according to the 3Q 2016 report. Dr. Jim Gaines of the Real Estate Center said proximity to Fort Hood is one likely reason the housing market has remained stable for so long despite a smaller number of houses being built. The median price per sf in Killeen is $73; the statewide median price is $99. Also see North Killeen takes revenge! 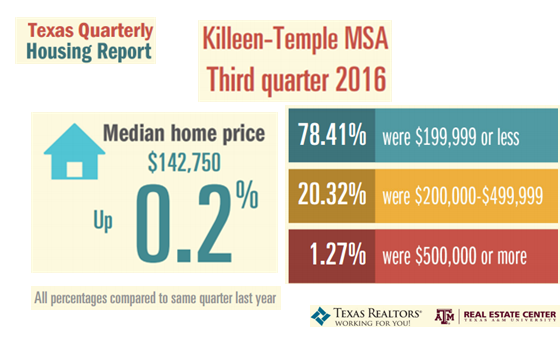 Home values 3Q 2016​ from December 6, 2016 of the Killeen Daily Herald.